Even though McAllen resident Jeanne Levy brushed off first responders’ initial evacuation requests from the 4500 block of Westway Avenue on Thursday, the 89-year-old knew when it was time to leave. 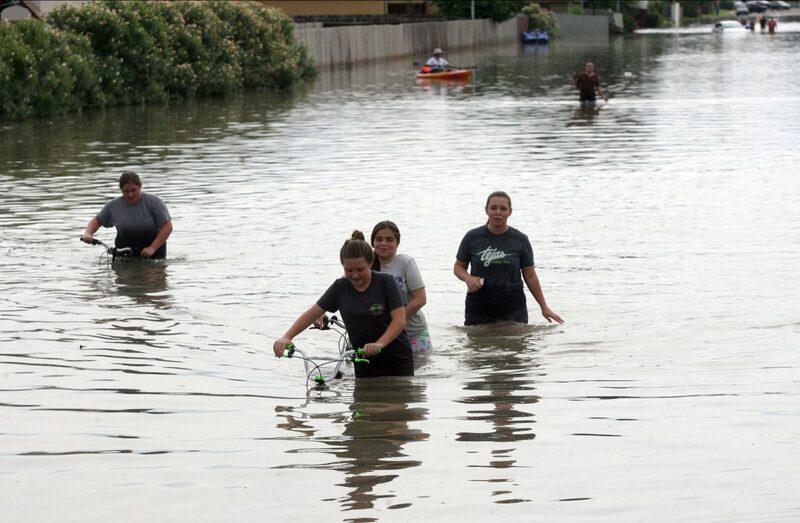 The Rio Grande Valley was slammed with another round of thunderstorms Thursday, leaving portions of an already-devastated region under several feet of floodwater for the second straight day, prompting Texas Gov. Greg Abbott to declare a state of disaster for Hidalgo County. Included in the governor’s declaration were Cameron, Willacy, Aransas, Nueces and San Patricio counties. Mayors of Hidalgo County’s largest cities — McAllen, Mission, Weslaco and Edinburg — had declared states of emergency for their respective cities prior to the governor’s announcement. 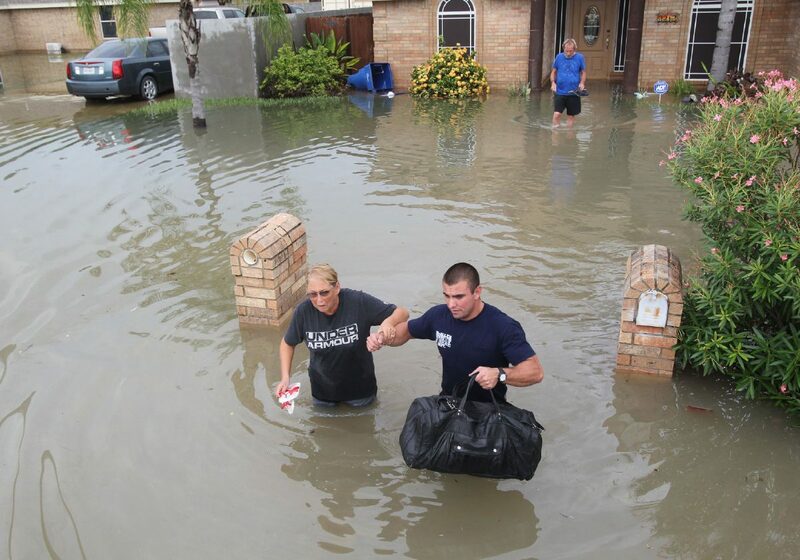 McAllen Fire fighter Aaron Resendez helps Susan and Richard Sunn from their flooded home at Oak Terrace subdivision on Vine and Bentsen on Thursday, June 21, 2018 in McAllen. McAllen Fire fighter Abraham Soto rides on a city dump truck looking for stranded residents at Oak Terrace subdivision on Vine and Bentson on Thursday, June 21, 2018 in McAllen. Mayor Jim Darling declared a state of emergency for the city of McAllen a few hours later, followed by Mayor Richard Molina for Edinburg. These cities, including smaller municipalities such as Alton, Palmview, La Joya and Hidalgo, were under flash flood warnings well into the afternoon. The disaster declaration, which was issued at 2:17 p.m., authorizes the use of all available state and local resources “necessary to cope with this disaster” and gives agencies more flexibility to use these resources at their disposal. Levy was one of hundreds taken to safety across Western Hidalgo County Thursday. First responders from various state and local agencies used an assortment of vehicles — boats, dump trucks and helicopters — to rescue homeowners and drivers from rising water. Firemen lifted Levy onto a flat-bottom boat then took her by bus to the McAllen Salvation Army, which took in more than 90 evacuees. 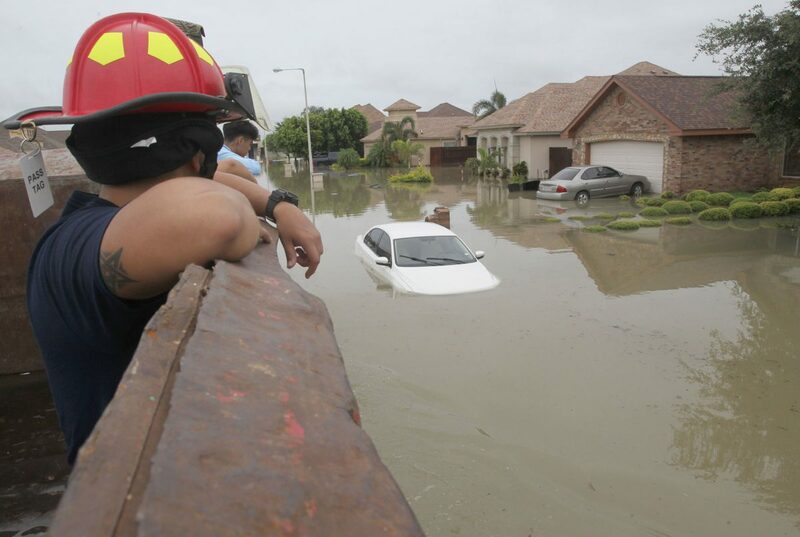 The worst flooding in McAllen occurred in the southern parts of town and in the northwest subdivisions, said Kevin Pagan, city attorney and emergency management coordinator. As many as 30 main roads were closed due to flooding at some point on Thursday, and the city distributed more than 1,800 sand bags to residents. In Mission alone, more than 300 people were rescued from cars and homes after approximately 7 inches of rain saturated the city between 6 and 11 a.m, said City Manager Martin Garza. Many were taken to a temporary “safe haven” at its parks and recreation building. Evacuees were subsequently moved to Veterans Memorial High School in Mission, which is serving as a 24-hour shelter operated by the Red Cross. The Mission school district is preparing meals for those at the shelter. Temporary shelters also opened in Alton, with approximately 60 people being taken to a “safe haven” site at Alton Memorial Jr. High School. The Texas National Guard and Border Patrol agents assisted local law enforcement and emergency assistance agencies to rescue stranded motorists and homeowners. Along Bryan Road in Mission, Border Patrol agents were seen Thursday helping a stranded driver and his passenger. The pair abandoned their SUV in the middle of the road before climbing into an unmarked vehicle. U.S. Customs and Border Protection’s search and rescue team, in addition to regular agents, were deployed to the Weslaco and Mercedes area Wednesday and conducted more than 100 rescues, said agent Marcelino Medina. CBP agents were mostly deployed to the McAllen and Mission areas Thursday and the agency did not have rescue numbers available at press time. The Hidalgo County Judge’s Office also issued a news release urging any resident in need of evacuation to accept it from all first responders.